RSPCA shares its top tips for keeping your pet safe this summer. Summer can be a dangerous and unforgiving time of year for pets, especially when left inside a hot car. An animal left inside a car on a hot summer’s day can die in less than 6 minutes with temperatures often reaching a scorching 73°C. Even when the windows are down dogs can still overheat and die. Animals suffer horribly in these situations – so make sure you never leave your pet in the car. Also, if your pet is travelling on the back of a ute ensure they are properly restrained and sufficiently covered as ute trays can get very hot in the sun. While most pets can swim it’s still important that you’re present when your pet is taking a dip. It can be very difficult for an animal to get out of the pool if they fall in, so if you’re not around to pull them out they could drown. Always keep the gate shut and fix any holes you might have in the fence. Hydration is key during the summer months, especially if your pet has a long, thick coat. Make sure your pet always has access to fresh, cool drinking water – if the water is in the sun it can heat up and become boiling, which can burn your pet’s mouth and won’t help with hydration. 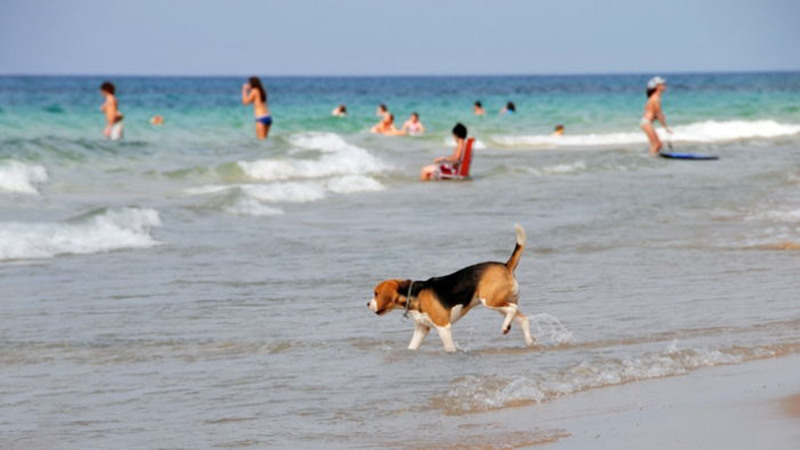 Sunburn doesn’t just affect humans, pets too can suffer from excess sun exposure, particularly those with white, non-pigmented skin and white coloured coats. It’s important to keep them out of the direct sun during the hottest hours of the day. It might be tempting to treat your pet over the festive season but there are a lot of foods they just can’t have. Avoid feeding them fatty foods/fatty meat and trimmings as these can cause pancreatitis (vet clinics report spikes in pancreatitis cases around festive season). It’s also important to avoid chocolate, corncobs, cooked bones, raisins, grapes and onions, among many others. Check with your vet before letting your pet indulge. New Year’s fireworks and summer storms can be very scary for your dog but there’s plenty you can do to keep them safe. Make sure your dog is micro-chipped and wearing an ID tag so that if they escape, they are identifiable. Take your dog for a long walk beforehand to tire them out. Create a comfortable hiding place for them and put the radio or television on to help mask the noise and pull the blinds closed. Let your dog be with you, try to stay calm and avoid fussing over your pet excessively, instead try to engage them in normal activities. Reward your dog for their calm behavior. Talk to your vet about the treatment options available for managing noise phobias and if you can’t ensure your dog is directly supervised on the night, consider boarding them so they’ll be safe.